The .exe brings up the message that windows cannot open this file. Do you have .Net 3.5 installed? What OS version do you use? great work.. i was wondering if i might be able to get some help am using emg30 with the MD25 through Arduino but i seem to be getting a communication board error..
have you come cross this? Nice one glad to see it ……..
Actually I want to know more about this cycloidal gear , and its profile and also about its manufacturing how it is made. And some more knowledge about gears. So sir I am requesting you to please help me in this. Very Nice. Thiank you for making this available. FANTASTIC! 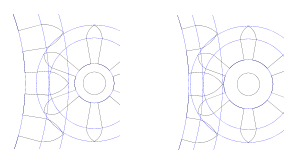 I’ve been waiting for some genius to make an open source cycloidal gear generator! And such a great interface, simple, Perfect! Thank you for sharing your brilliance. Now all we need is escapement wheels…! Thank you so much. I’ve been hunting for one of these. An excellent utilty – thanks. Is there any chance of a DXF output as well as the SVG as it would be nice to be able to see the output in AutoCad? Phil, I don’t have plans to add support for DXF but you might be able to get the desired output from within Inkscape after installing this add-in: Inkscape DXF Export Extension. I have not tried it myself, though. Thanks Rainer. I have tried Inkscape but when I try to open the DXF in Autocad 2005 I get very strange results which make it unusable. Cheers. Phil. I’m building the Clock from ScrollSaw woodworking magazine.Summer 2013 issue 51. On the article that covers ratchet mechanism, how is the weight cord attached and how are the weight attached to the ratchet assembly. Any info would help. 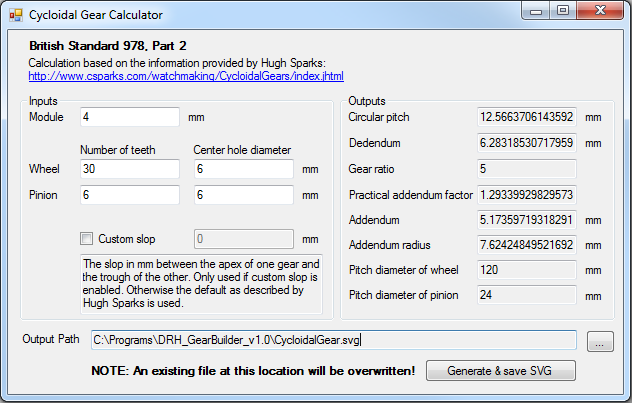 I am happy to announce a new online version of my Cycloidal Gear Builder. It runs in the browser, immediately shows the resulting gears, and supports DXF output. Check it out! Thanks for making this program available. Unfortunately I was unable to download the source via SVN, the server gives the error that it can’t find it. Any advice on how I might proceed from your program and Hugh Sparks’ work to getting the tooth profiles in rectangular or polar co-ordinates? I have a small cnc lathe that is controlled by sending X,Y coordinates. Is there any way I can use your program or an equation from it to calculate moves to make a gear cutter. It seems like the tops of clock teeth are derived from circles and the base is trapedoidal? Tthis would be easier than printing the teeth and measuring the paper! Fascinating information. Look forward to playing around with this and helping people understand the concept of cycloidal gears to customers, and lay people. 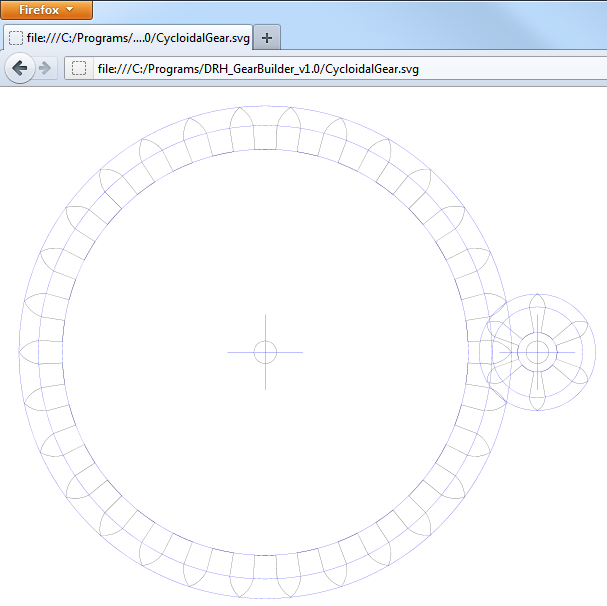 It looks like you may not be monitoring this blog any more, but in case you happen to see this, the “cycloidal gear builder” is a really nice program, thank you. Unfortunately the DXF output I have downloaded from is failing when imported into AutoCAD 2013. I will try and edit the DXF file to make it work; the important parts obviously are the polyline entities. Please see my post http://www.hessmer.org/blog/2015/07/13/online-involute-spur-gear-builder-part-2/ which describes how the dxf output can be loaded into the free Inkscape program and then exported in other formats. This will likely work for AutoCAD. Thank you very much, I’ll try that.